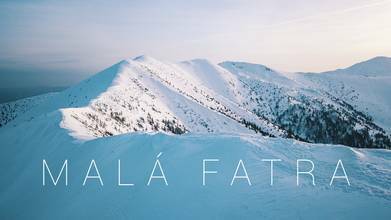 Malá Fatra is a mountain range in north central Slovakia, part of the Western Carpathian Mountains (which go by different names in different countries). Their highest peak, Veľký Kriváň, has an altitude of about 1.7k meters (just over 5.6k ft.). Who better to show off the gorgeous mountains in the dead of winter than HikeTheWorld? In this video, they do a marvelous job of capturing the beauty of this winter alpine scene from a bird's eye perspective. Description: Little Fatra is the 4th highest mountain range in Slovakia and one of the most beautiful. Veľký Kriváň is with altitude of 1709 m highest peak of this national park. But symbol of Little Fatra is massive rocky peak called Veľký Rozsutec with 1610 m. Part of the mountain range are also system of canyons called Jánošíkové diery, which are most attractive during winter, as not many people visit them during this season.